The American way of life, based on a strong middle class established through free enterprise and ownership of private property, is under assault like never before. That assault will dramatically increase in September as thousands of Non-governmental Organizations (NGOs), global elitists and United Nation's bureaucrats converge on New York City to reboot Agenda 21. This time they are calling it the 2030 Agenda for Sustainable Development. This new 15 year plan demands 17 points of global control to reorganize the world into a Socialist utopia by 2030. If allowed to take control, there will be no ownership of private property, very little individual choice, and national sovereignty will be a thing of the past in this new agenda. Meanwhile, the Obama Administration, through Housing and Urban Development (HUD), is busy implementing the "Affirmatively Furthering Fair Housing" rule (AFFH). This program targets specific neighborhoods that have taken certain HUD grants. Eventually, however, it is fairly certain that such policies will be expanded to every neighborhood in the nation for social engineering. The plan imposes government mandated quotas of racial, ethnic and monetary levels to be forced on higher income, level neighborhoods to make them more "fair" as social justice replaces equal justice. The 2030 Agenda and AFFH are mutual and direct assaults on our form of government and on private property rights. If ever there was a time for Americans to finally stand up and say "enough," now is the time. Of course, the 2030 Agenda and AFFH are only the latest, most drastic assault to re-engineer American society. For more than two decades property rights have been under attack in the name of Sustainable Development. We've all observed the actions of Planners in nearly every community in the nation as they are busy promoting their visions of our future through what they call healthy, happy communities where neighbors interact, parents play with their children, no stress from long commutes, as all the conveniences of living are just a walk down the street. "vision" for our future is how the professional and government planners have determined that none of it is possible unless they design our cities, control our private property and rule over our personal life choices. To create this "utopia" a process called Smart Growth or "visioning," is implemented and sold to us as a means to protect and guide the community to "sensible growth planning." Everything we want and need, they promise, will be just a walk down the street for our jobs, schools, stores and libraries. What more could we possibly want? Since the early 1990s most communities have created and imposed a comprehensive development plan that, in many cases, is mandated by state government. These are driven by non-elected regional councils that have been put into force without public knowledge or approval. They are fueled by federal grant money that mandates specific rules for development. It's all done in the back rooms, out of sight of the general public. Unseen hands reach out to decide the community's future and EVERY community is now being structured the same. The plans, in reality, have little to do with creating healthy, wealthy communities. Hidden in all the feel-good rhetoric is a political agenda based on redistribution of wealth and control of resources. The American Planning Association (APA) is one of the most powerful planning groups operating in the nation and it works to install the rules and regulations for how we live in nearly every city, county and state. The APA is a member of the Planners Network. The Network's Statement of Principles says, "We believe planning should be a tool for allocating resources... and eliminating the great inequalities of wealth and power in society... because the free-market has proven incapable of doing this." That single paragraph, the root of the philosophy of Planners across the nation, advocates Socialism's redistribution of wealth schemes which operate under the label of social justice. These social engineering schemes imposed through Smart Growth plans are a direct attack on the middle class. These are nothing but tools to divide our citizens and create racial strife and envy. And it unites the goals of community planners with the newly announced HUD AFFH regulations on neighborhood diversity. The HUD plan dictates quotas that neighborhoods, whether they are predominately Hispanic, Black, White or Asian, must be broken up by bringing in different income and ethnic groups. The plan fits perfectly with the Planners Network Statement of Principles for redistribution of wealth and resources, as clearly stated in the Planners Network Statement of Principles. In Smart Growth cities, such as Portland, Oregon, strict controls are placed on community area growth, which planners negatively label "Urban Sprawl." This means that only a certain amount of land is available for development and growth. As population naturally grows inside that restricted area, the Planners must increase density regulations, forcing more and more multifamily apartment buildings instead of single family homes. As the population continues to grow, this eventually leads to the necessity of "stack and pack" high rise apartment buildings. You will not have the choice to live in single family suburban homes or in a rural area. These won't exist. In fact, just recently, Smart Growth city Seattle, Washington announced that it is looking into the possibility of banning single family homes. Under Smart Growth, one size fits all. Obviously, what is missing in all of this planning is a consideration for private property ownership and the natural rights that historically have gone with it. The fact is, Sustainable Development cannot be implemented without diminishing private property rights. Every person, Black, White, Asian and Hispanic, wants to choose how he or she lives rather than to be dictated to by government. However, the use of eminent domain to enforce a top-down decision making process necessary to complete the "visioning" plans leaves little room for individual wants and needs. In rural areas more such controls over private property are growing through the use of Conservation Easements that restrict what land owners, especially farmers, can do with their land; what crops they can grow and how they may grow them. Conservation Easements are, of course, sold as voluntary, but there are powerful forces working to scare and intimidate farmers into signing. Once they do, the land owners find they have given up major control of their property forever, usually to a private land trust that has little, if any, government oversight over its actions. More regulations on land come from the EPA, as it moves to control every drop of water in the nation. And there are even more controls through the federal Bureau of Land Management (BLM). That out of control agency has even resorted to armed standoffs in an effort to move ranchers from their land, such as in the Bundy case in Nevada last year. Every agency of the federal government, including the Department of Transportation and FEMA, are in on the controls over what owners can do on their own property. Add to these federal agencies the overlapping controls by state and local governments and non-elected regional councils, and you have a matrix that is choking off any possible existence of private property ownership and control. As a result, across the nation, there is a growing attack on private property ownership and owner control. Interestingly, as the assault on private property increases, our nation's freedoms and wealth are diminishing at a nearly equal rate. That's because private property ownership is the key to both a strong, healthy economy and the eradication of poverty. The traditional American system of private property ownership and control was the root of America's rapid rise in prosperity. More than 60% of American businesses were started by individuals investing the equity in their homes as they built the most prosperous nation on Earth. Historically, other, much older nations were unable to compete with America's rapid rise, precisely because they didn't provide a way for citizens to benefit from owning property, if they were able to own it at all. In fact, most of the world's poorest nations are that way because they won't allow their citizens to own private property. Consequently, with the new Sustainable Development rules that are rapidly diminishing private property ownership, America's middle class is disappearing and the divide between rich and poor is growing. Third world hopelessness is closing in on the United States of America. Clearly, something must be done to counter this organized attack on American private property rights. In addition, if freedom is to ever gain a foothold in the world, a new effort must be made to help those in other nations to gain their right to own and control private property as their true path to ending poverty. First, a Statement of Principles has been drawn up to clearly define what we mean by private property rights. "Private property ownership," says the Statement, "includes land, possessions, fruits of ones labor and ideas." "Without private property ownership," declares the statement, "freedom is not sustainable." Now, with the Statement of Principles to guide us, APC seeks every supporter and promoter of private property ownership around the world to join in a unified movement. First, property rights activists and supporters should read the Statement of Principles. After reading, if you are ready to stand with these principles, then sign the agreement to uphold and promote them. Along with the creation of the Statement of Principles, a new symbol has been forged to unite the movement. The symbol's message is People * Property *Liberty. This message clearly depicts the reasons why private property rights are so vital. People cannot be free without property rights. This symbol should now be used by every activist and group around the globe that accepts and signs our Statement of Principles. 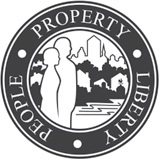 The symbol can be used in newsletters, web sites and other publications to clearly show unity in the movement and our determination to make private property ownership a major issue that must be protected in all public policy. It is time for governments around the world to learn that private property ownership is the key to freedom and prosperity. Public policy must be controlled to respect property owners as OWNERS!